This is part of a triptych print featuring Samurai Sanada no Yoichi Yoshihisa fighting at the battle of Ishibashiyama in the year 1180 AD. Original artist: Utagawa Kuniyoshi (歌川国芳) (1797-1861). Original publisher: Yamaguchiya Tobei (山口屋藤兵衛). 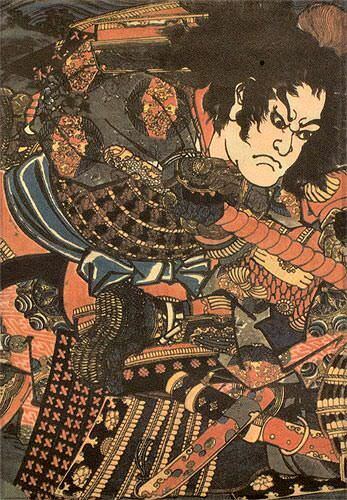 Original woodblock was created in Japan, around 1844 (possibly as early as 1835 or as late as 1848).